Riomaggiore, one of my stops in Cinque Terre while visiting Italy in 2014. I have been waiting to find the time to complete this piece for a long, long time. Painting buildings is hard for me. Not because it is technically difficult but because it is so restricting. I enjoy the freedom when painting portraits and landscapes. When painting buildings, your lines must be exact to get the perspective right. It needs to be clean and well thought out. I spent months just drawing this painting out to make sure I had a strong foundation. I love the colors, I love the moody sky. I love the beautiful grey church with its lovely details. I am so pleased with this painting. I am even more pleased that I am done painting it! 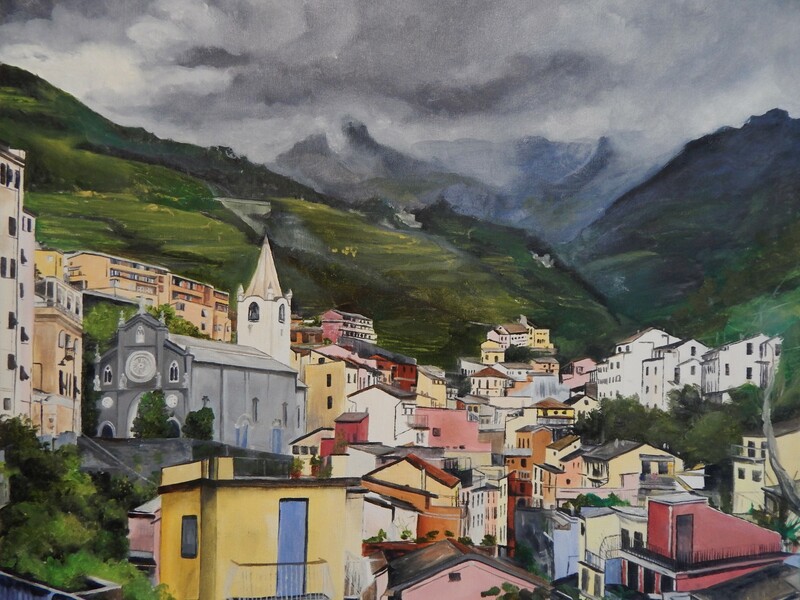 This entry was posted in Uncategorized and tagged art, Biggar Saskatchewan, canadian artist, cinque terre, female artist, Italy, landscape, mist, Oil Painting, riomaggiore, town scape by michhoppe. Bookmark the permalink. First of all, my condolences. I’m sorry the circumstances for your Saskatchewan trip are so sad. I would love to have you and your family visit my studio and hopefully make it a bright experience during your time in the Prairies. I haven’t travelled much but I do have big travel goals. I am currently working with VM Travel Adventures to put together a trip to Germany, Amsterdam, and Alsace. I will be leading the trip creatively with a couple beginner watercolor classes and discussions on creative outlets and finding inspiration! I’m hoping we have the numbers to make it work. The paintings I could bring back after inspiration like that would be amazing! I am so happy that you love my work. At this time I do not make prints, cards or reproductions. I am selling originals…which I have been told lately is kinda crazy but I have too many mixed feelings about selling prints. It’s hard for me to bring myself to do it just yet. I will continue to mull it over and promote them when they become available. Please email me when you want to make concrete plans and set dates. I will be very happy to accommodate your group.